The other day Rachel got the first dose of her flu shot and I was making an appointment for the booster dose for four weeks later. Well, four weeks from last Thursday is going to be Thanksgiving. And we’re going to be on a Disney cruise, but that’s another story for another time. The point today: HOW ARE WE LESS THAN FOUR WEEKS AWAY FROM THANKSGIVING?! I feel like I say this every month, but, geez, time is F L Y I N G by so quickly. So, dear October, you were hotter than usual and faster than usual, but you were good to us. We saw friends during Fall Break at the beginning of the month and then more friends at the end of the month for Murray State’s Homecoming. 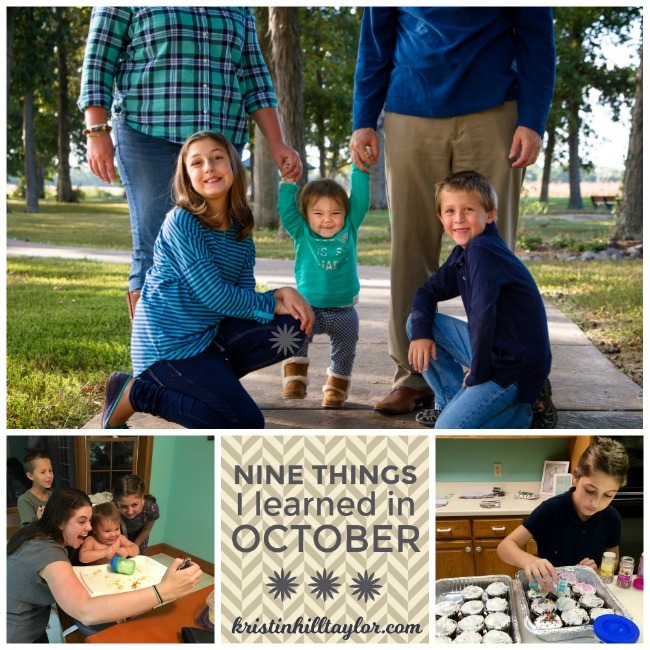 We closed on our now-old-to-us house, had family pictures taken, and stayed busy with school activities. Before you’re history, October, let’s remember what you taught me. 1. The bacon maple doughnut our local doughnut place makes is amazing. And, yes, doughnut is the proper spelling. Donut is Dunkin’ Donuts’ fault. I had it twice this past month. 3. My baby is a toddler. And watching her toddle around makes me so happy. And while I’m not doing monthly posts to document her growth, I’m thankful for the ways social media allows for that. 4. Carrollton’s album is worth putting on repeat. I heard “Let Love Win” on the radio and looked it up later. While doing so, I listened to other songs and ended up with the whole album. Also, turns out some of the band members are Kentucky boys, so that’s a fun fact! 5. Seeing one of my kids embrace generosity makes me proud. And by proud I mean relieved that I may be doing something right. 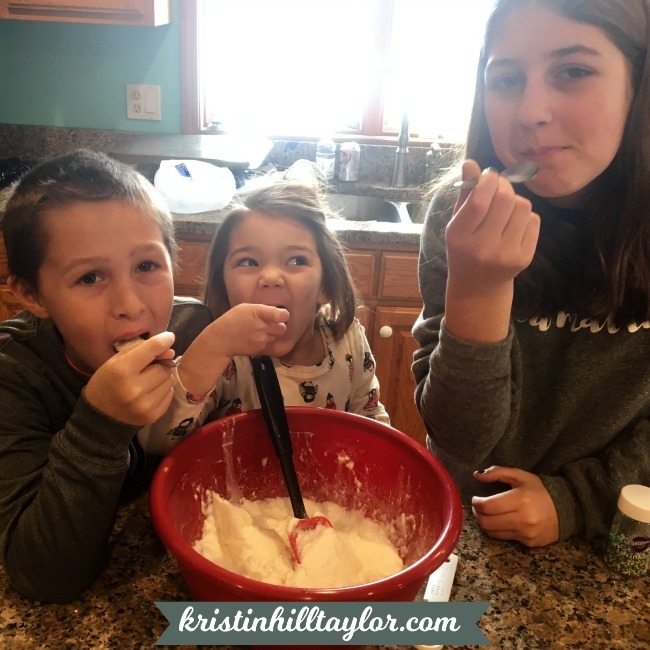 If you missed the post about the bake sale Cate and two friends organized to raise money for Guatemala, then I encourage you to check it out – and not just because she’s my girl. We’re also packing shoe boxes for other children soon too. 6. Likewise, when my boy edited his birthday party invitation, my word-loving, mom heart was proud. 7. I always say summer is my favorite (and it is for so many reasons), but I really do love fall. I think I say this every year, but it always falls fresh on me like a new revelation. It’s a busy season, but there are many opportunities for parties and events and that makes us happy. Hello, family of extroverts. 8. I went to a paint party and enjoyed myself. I just said I liked parties, but I don’t like to paint. But I successfully painted a wooden Kentucky with gray and aqua chevron stripes. It was a fun girls night out with my oldest daughter and some of our friends. Plus the party raised money for our church’s adoption grant fund. 9. One word can rock my world, in the best and hardest ways. And then when God shows me that one word in a couple places in a way that encourages and convicts simultaneously, I become mush. This time is was AMBASSADOR in my Precept study of the Sermon on the Mount and in “Parenting” by Paul David Tripp. I wrote a whole post about it, and am I’m giving away a copy of “Parenting,” so be sure to go enter to win a copy. How did October treat you? It jumped out at me when I was working through my Sermon on the Mount study recently. I was reading about being peacemakers when the Precept study took us to these verses from Second Corinthians. Of course, my mind went to parenting like it has time and time again since I started this study in August. So I was dwelling on the fact I’m a representative of Christ to my children as I went about my day, which in all honesty was a hard one. Disappointments and inconveniences filled that day. 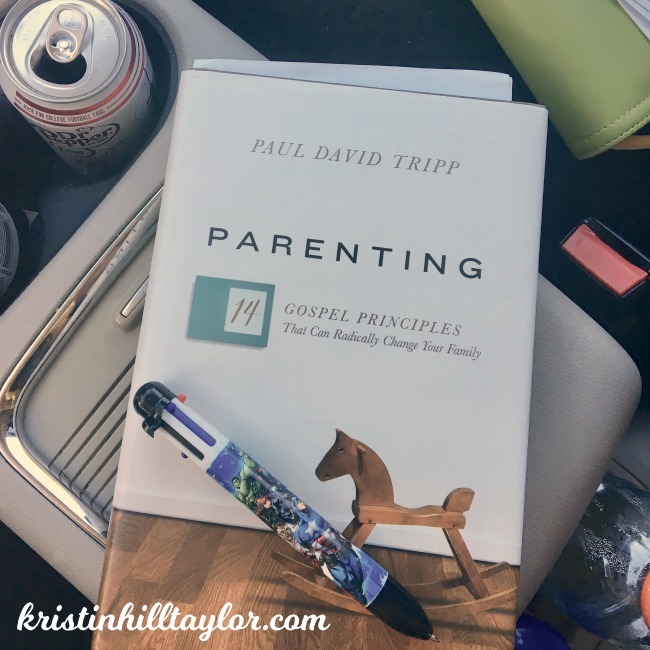 While waiting for my kids at the bus stop later that same day, I finally opened “Parenting: 14 Gospel Principles That Can Radically Change Your Family” by Paul David Tripp because I had said I would read and review it on my blog. The deadline was approaching and I needed to get started. AMBASSADOR. It was the first word in the whole book, the title of the introduction. That same word showed up and broke me. Four pages in, and I was crying. 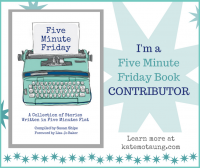 I was grieving and dealing with conviction and rejoicing with hope. 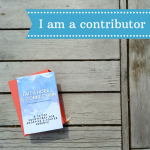 I couldn’t even finish the introduction in that sitting because I had to digest this more: By kids don’t belong to me, but I’m Christ’s ambassador to them. I know, it’s probably not even a new concept to most Christ-followers, but it was striking me in a fresh way I still can’t shake. 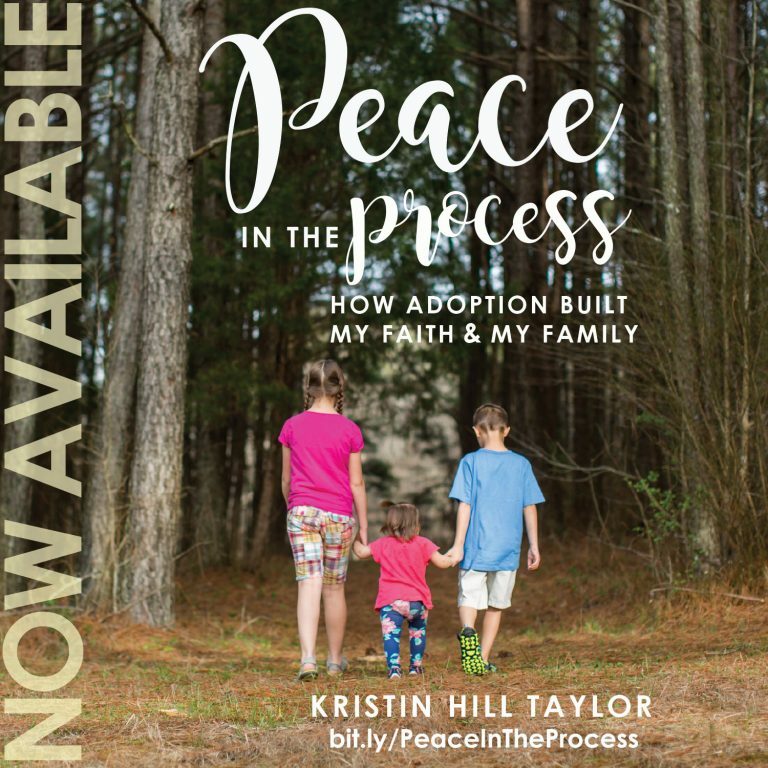 Because of my emotions and revelations, I needed a couple days to get through the introduction of “Parenting,” but the shift in perspective was exactly what I’ve needed to be a better wife and mom. It’s really good stuff. Tripp starts the book writing about the differences between ownership and ambassadorial parenting. Basically, our human default is to treat our families as possessions. It doesn’t seem bad because we talk about the good things we want for and from our children. We talk about goals and hopes and dreams we have for these people we love. But we get really caught up in producing those things by ourselves. We leave out the One who truly creates families. Ambassadors faithfully represents the message, methods and character of another leader – in our case, Jesus. I don’t own my family, but I can represent Christ to them. Y’all, this concept is rocking my world. In a matter of days, it’s made my life harder and easier in the same moment. It’s give me a focus and convicted my heart. It’s slowed me down and helped me see beyond the daily frustrations of dirty floors and a never-ending to do list. And, admittedly, it’s interrupted my finishing Tripp’s book. I’ve since read a few more chapters, but I keep coming back to that introduction about how I’m an ambassador of Christ to my kids. In this life-giving book, Paul Tripp offers parents much more than a to-do list. Instead, he presents us with a big-picture view of God’s plan for us as parents. Outlining 14 foundational principles centered on the gospel, he shows that we need more than the latest parenting strategy or list of techniques. Rather, we need the rescuing grace of God — grace that has the power to shape how we view everything we do as parents. This 224-page hardcover book was published by Crossway (Sept. 30, 2016). Paul David Tripp (DMin, Westminster Theological Seminary) is a pastor, author, and international conference speaker. He is also the president of Paul Tripp Ministries and the executive director of the Center for Pastoral Life and Care in Fort Worth, Texas. He has written a number of popular books on Christian living, including “What Did You Expect?,” “Dangerous Calling,” and “New Morning Mercies.” He lives in Philadelphia with his wife Luella and they have four grown children. For more information and resources, visit paultrippministries.org. I told you I haven’t actually finished the book because this is one I’ve got to take slow, but I have no doubt I’m going to be challenged and encouraged more throughout the pages. And I’m happy I get to give one of you a copy too. This giveaway will be open through Wednesday, Nov. 2 to U.S. and Canadian residents. Use the Rafflecopter widget below to enter to win.